Names based on play on words can be a bit of a double edged sword. Take this blog, I suspect that I have had a few visitors who thought my site content would be somewhat different to my rambling thoughts on food and drink and as a result left sorely disappointed. Others may be looking for food content, but misread the blog title and assume it is a site with somewhat dodgy content with the food references a lure to catch the unwary. With restaurant names, a play on words can leave the place in question open to easy lampooning. 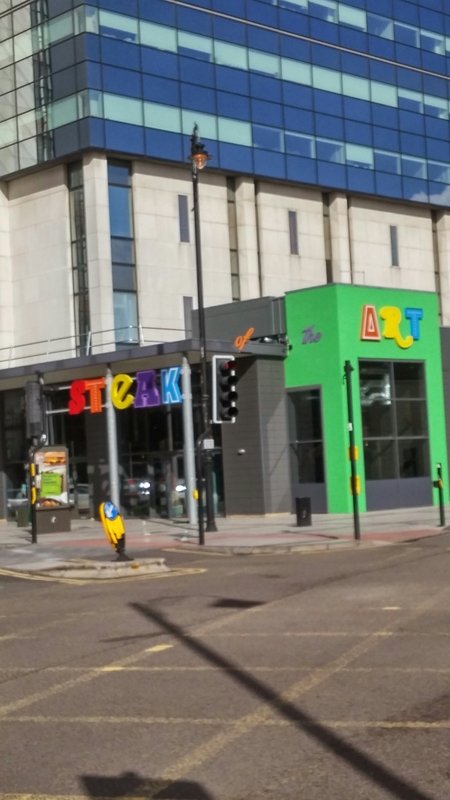 So “Steak of the Art ” could lead to references to “it’s a right steak ” or ” it drove a steak through my foodie heart”. A couple of mates and I decided to check out the “steak” (enough of that methinks) of play at the relatively new “Steak of the Art ” restaurant in Cardiff of a lunchtime and, in particular, to take a look at their “Menu Rapide ” offering (£9.95 based on a short menu of mains and a drink between 12 and 6pm, excluding Sundays). I like that this is available on both Fridays and Saturdays and can see it being popular straight after work on a Friday with people looking to fuel up pre hitting the bars in town. Well it is certainly different, that is for sure. Outside signage makes it look to me a bit like a kiddies play centre if viewed from afar. and you can sit in a giant dalek if that floats your boat. There are some nice cubicules/pods in the place with the four of us seated in one upstairs just along from the in-house art gallery. 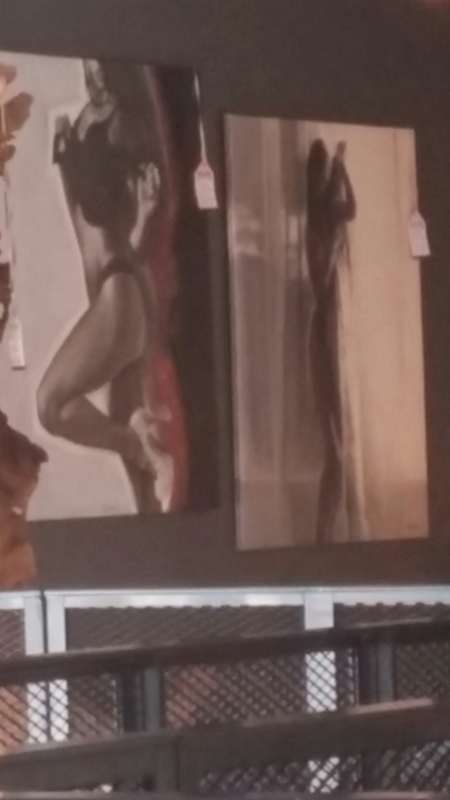 I understand the aim of the ‘art’ element of the place is to support local artists – although it seems it is early days in terms of there being local artist on display. Still an admirable idea. Some people I am sure will love the look, others will hate it. I was sort of neutral – didn’t wow me but didn’t offend either. From the “Menu Rapide” I went for the steak and chips with, on asking the waitress, the steak being a bavette. This is one of the cheaper cuts of steak and is in an area of the animal where the muscles do a bit of work. As a result it is usually tasty, but not the most tender and should be eaten rare otherwise it becomes very tough. If you are thinking of ordering this I would strongly suggest asking for it to be cooked rare (at worst medium rare). If you like your steak well done/incinerated this is perhaps not the steak for you, as it will go tough as old boots. 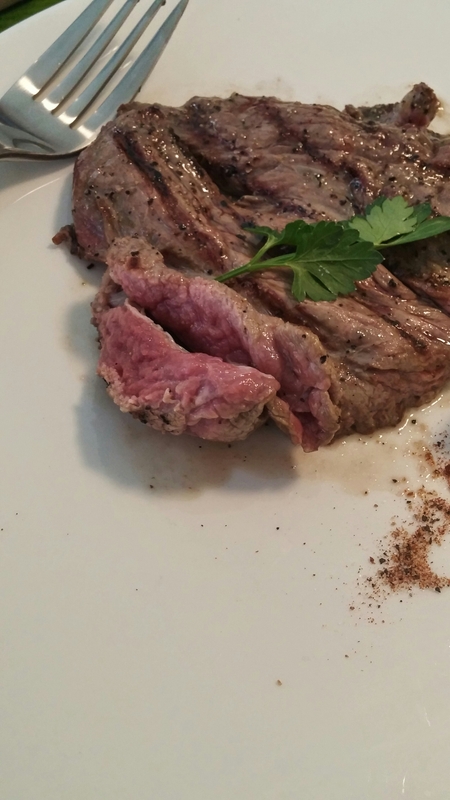 As I had hoped, it was a juicy piece of meat with plenty of flavour. It was also cooked (rare) exactly as I asked (it always amazes me how often restaurant get cooking a steak hopelessly wrong) and well seasoned. It wasn’t the most tender piece of meat but that comes with the territory with a bavette so no complaints on that front and I had a fearsome looking steak knife to do the cutting job. All in all I enjoyed it and left nothing on the plate. Others had either the burger or the pulled pork sandwich from the “Menu Rapide”. These came on boards which I don’t like, but luckily my steak came on a proper plate. The burger (with cheese) was pronounced as alright, with a nice not too dense texture but lacking a bit of seasoning. It came without any hint of pink and on ordering no question was asked as to cooking preference (something I have said on the blog before I would like to see asked, failing which an explanation should be given as to why it cannot be cooked to the diner’s preference). Not how I like a burger (medium rare for me everytime), but the person in question was happy enough. The pulled pork bap (which two of the guys ordered) had a decent amount of filling in it but was a bit lacking in the flavour department. The meat also wasn’t “pulled” that well with one having a particularly large chunk of unrendered down fat in it. Now I like a bit of fat myself, but even I baulked at this. All the meals came with a choice of hand cut chips or salad or sweet potato fries (£1 supplement for the latter) as well as a red cabbage (very regulation) slaw (except curiously my steak which came with just chips). 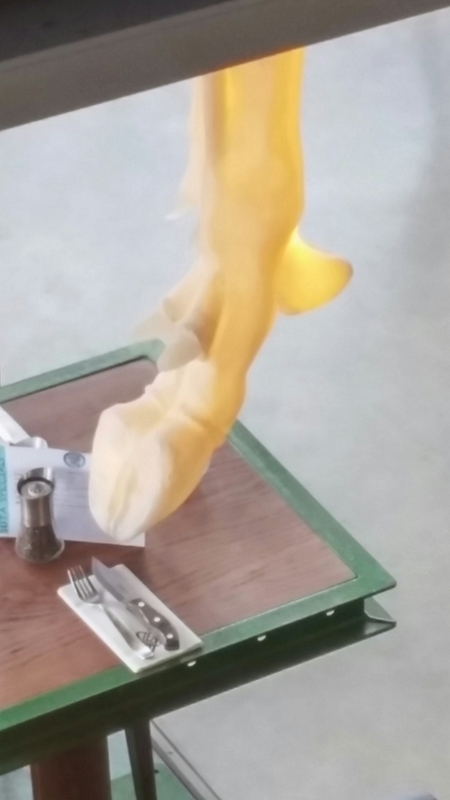 Have to say, I was a bit disappointed with the chips as they, in my opinion, had been taken out of the fryer a bit prematurely. Mine were not as fluffy on the inside and crispy on the outside as I like them. Portion size the amount of chips, chunky as they were, was a little on the small size. 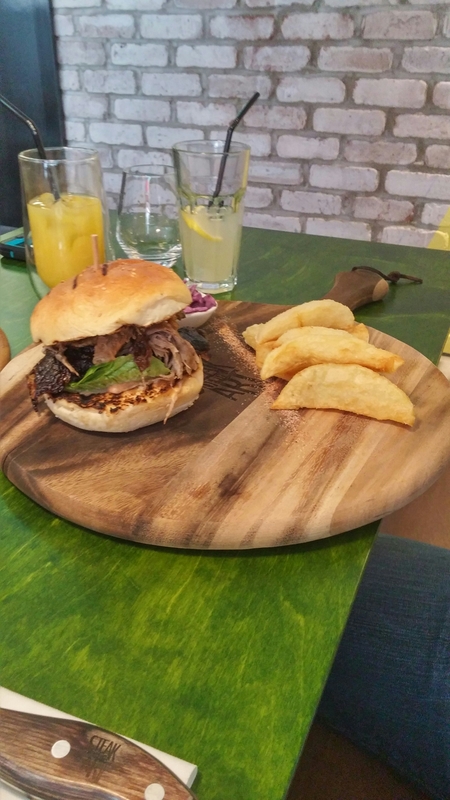 The opinion of the table was that the chips at Pitch bar and eatery were much better. 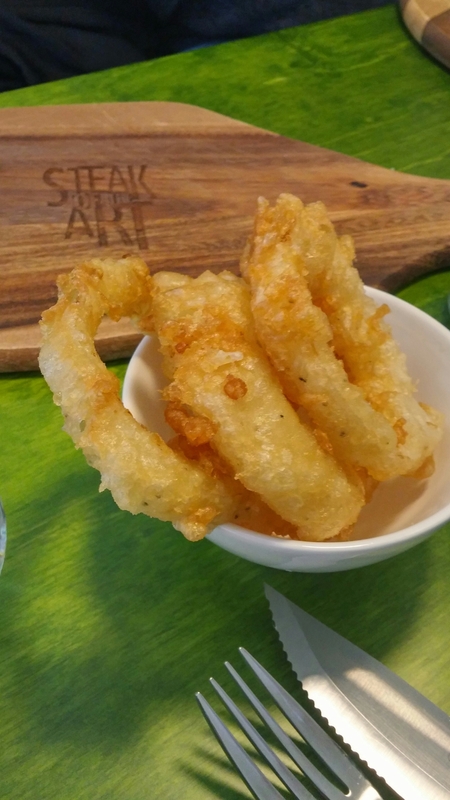 We ordered one side of onion rings (£2). These were pleasant enough, being nice and crispy and not oily. They weren’t seasoned so we did need to add salt to them. 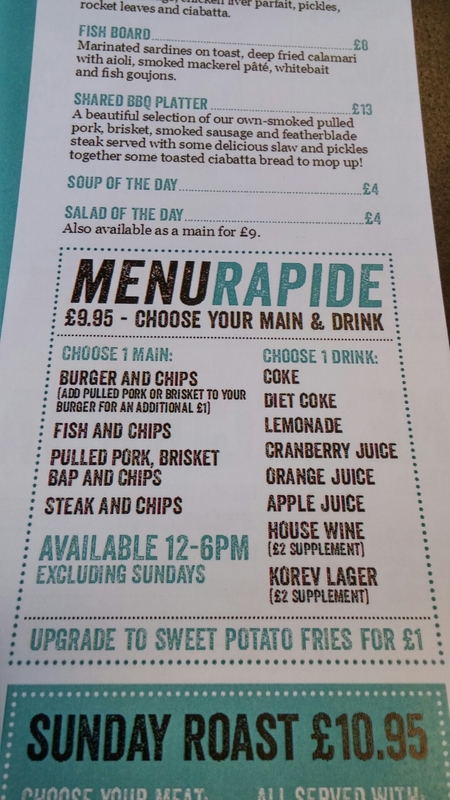 The “Menu Rapide ” includes a soft drink (or for a £2 supplement a pint of beer or glass of wine). 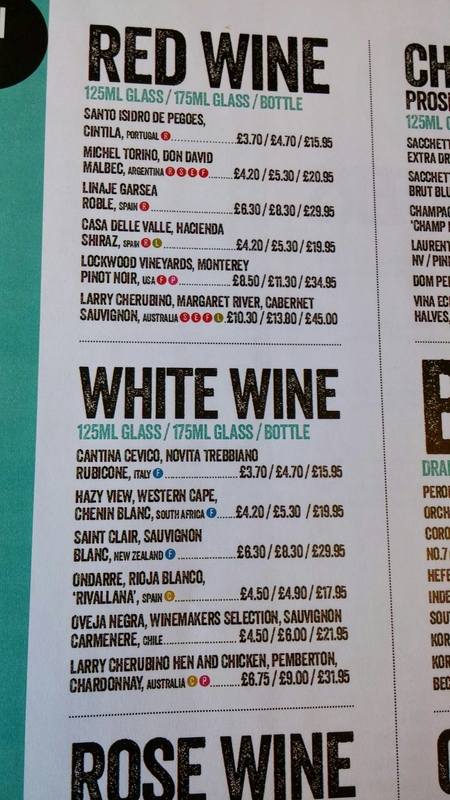 Whilst I opted (it being a work day) for a soft drink, the short wine list has some interesting wines on it that are a bit different from your bog standard list and shows a little bit more imagination and thought than goes in to many a restaurant wine list. 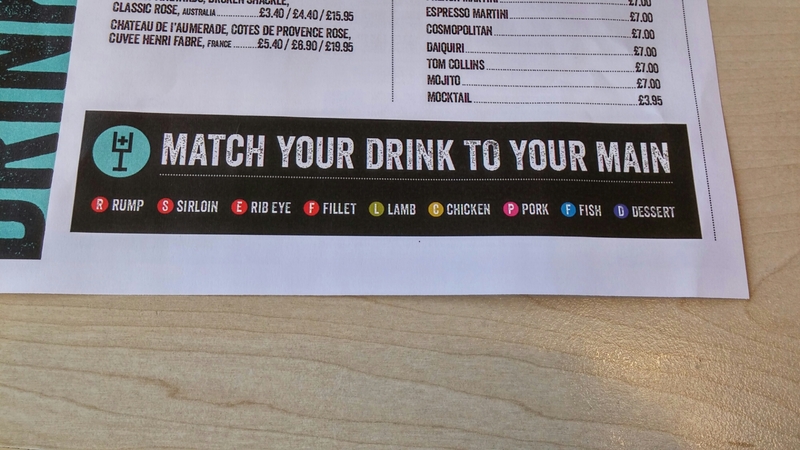 It is also nice to see they have matched the wines with steaks and other food types on offer via a simple colour coding system. I cannot for the life of me, mind, see why they have not suggested the Linaje Garsea Roble, a Ribera del Duero tempranillo wine, as a good match for lamb. Spanish tempranillo and lamb is a match made in heaven! 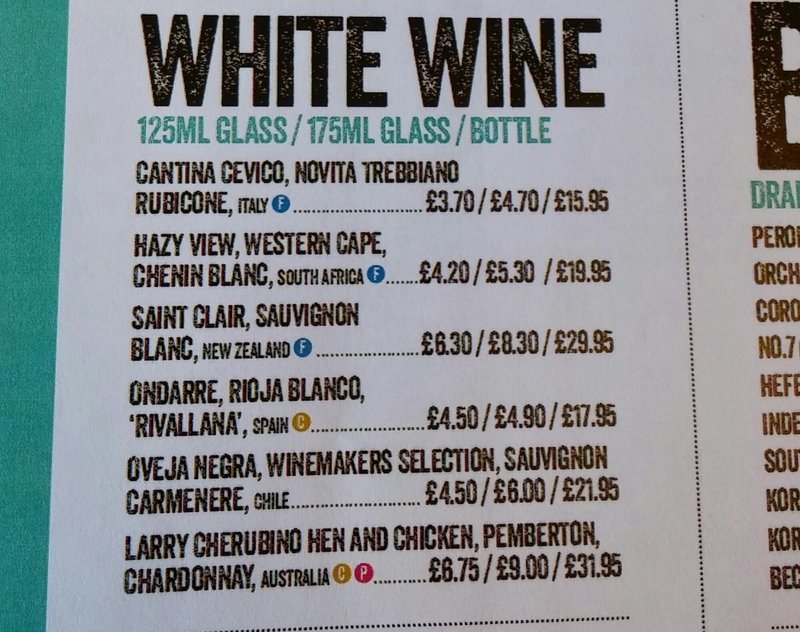 Also, in the whites, does the poor ‘Oveja Negra, Winemakers Selection, Sauvignon Carmenere’ from Chile really go with nothing at all – as their coding suggests? Mark ups on the wine at around 250% over retail prices are a little on the high side. There is also a decent selection of West Country beers and ciders reflecting the places Bristolian origins. 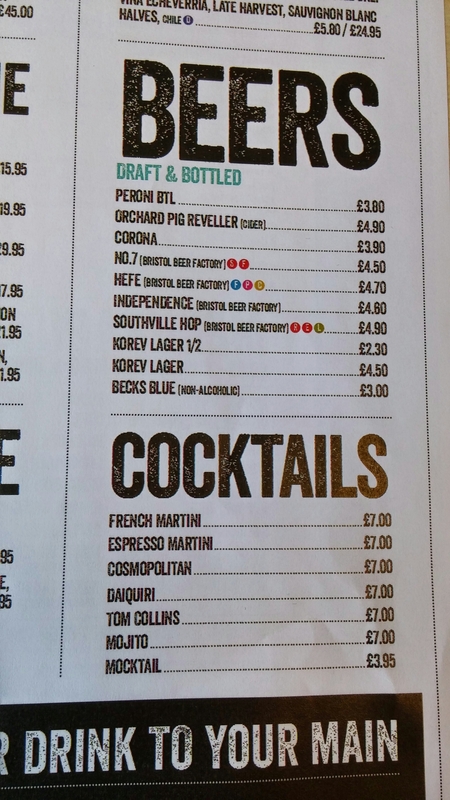 It would be nice if (this being Cardiff) they could add some local Welsh beers and ciders to their drinks offering. The drinks based on the all in “Menu Rapide” price were bog standard from a carton (sitting opposite one of the stock rooms we saw the cartons when the waitress went in) and came in a double skinned glass seemingly designed to limited the volume of drink (especially when they added a generous amount of ice). 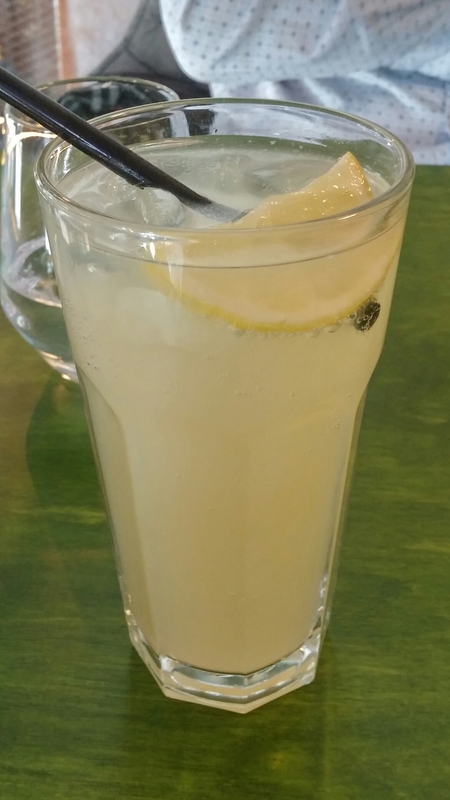 I ordered lemonade as they were out of the bog standard clear stuff usually on offer and were happy (at no extra charge) to subsitute it for cloudy Victorian lemonade (not in the same mean glass used for the other drinks as, presumably, not usually part of the “Menu Rapide”). Service was pleasant and helpful, with the waitress who served us showing admirable patience when I had a “senior” moment in trying to pay my share with a card. My only slight complaint on this front was our meal was not very “Rapide”. It was not that busy, but we needed the whole hour to get and eat just one course. Not great if you only have a strict one hour lunch break. Hopefully this is just a case of bedding in and turn around will get quicker. The damage for four of us was £41.80 (including drinks, but excluding tip). I thought it was okay. They certainly know how to cook a steak, with mine being tasty and cooked as I like it. 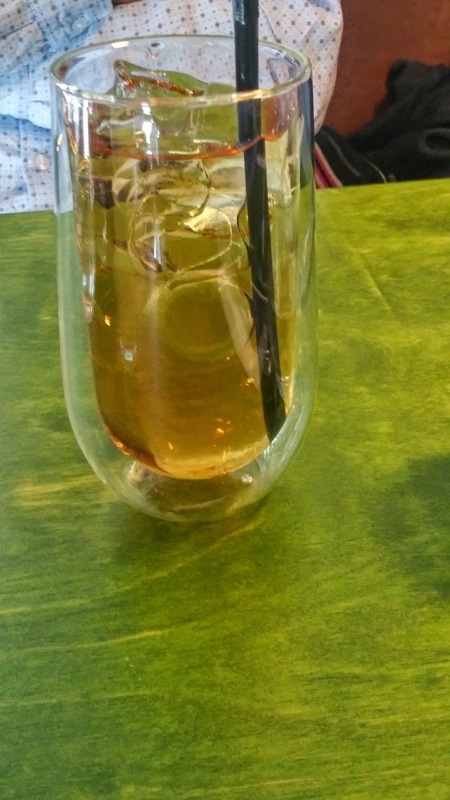 There were, however, a few niggles and some (to my mind) unnecessary meanness on the drinks front. Will it succeed in pulling in lunch time punters. Probably, based on the “Menu Rapide” offering, but ditch the tight fisted glasses currently used for soft drinks in that offer is my advice. That sort of thing just irritates people, as nobody likes a “cheapsteak”. Pushing it a bit , but see what I mean regarding play on word names! Would I go again? Probably, as the steak was good. 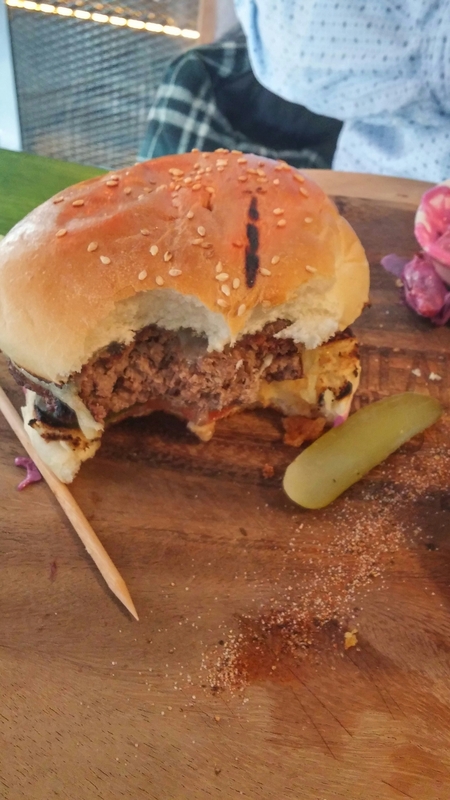 This entry was posted on Feb 22, 2015 by solicitingflavours in Barbecue, Beer, Burger, Cardiff, Drink, early bird menu, Fixed Price Menu, Food, Food and wine products, lunch, lunchtime, New restaurant Cardiff, Restaurant Review, Sandwich, steak, Steak of the Art, Wales, wine, wine mark up.